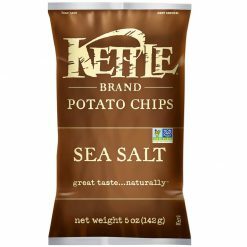 Delicious and crunchy sea salt potato chips. There are simply three ingredients in this classic chip: potatoes, oil and sea salt. The pureness of a whole potato, thinly sliced, cooked to golden perfection, and seasoned with fresh sea salt delivers undeniable flavour and crunch. In line with the brandEEs EEnatural promise,EE all potato chips are gluten-free and made with natural ingredients, containing no trans-fat, MSG, preservatives or genetically modified ingredients. Ingredients: Potatoes, safflower and/or sunflower and/or canola oil, sea salt.